I love reading 'serious' books on Scribd. It makes me feel like the subscription is completely justifiable. I might have spent most of January working my way through The Last Kingdom series by Bernard Cornwell. But I also read Platform, Michael Hyatt's book about digital and social self-marketing. That makes my Scribd subscription into a sound business investment. I've been reading Michael Hyatt's blog for a while. I've downloaded a few of his free ebooks and picked up lots of ideas for planning and productivity. In spite of being a mega-successful blogger with more than 100,000 followers on Twitter, he still seems to be relatively down to earth. 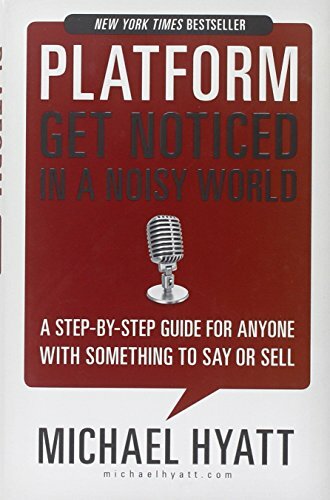 Platform: Get Noticed in a Noisy World is a brisk introduction to digital and social media marketing techniques, written by someone who has actually used the techniques he's talking about to build a successful business. It makes a case for building your own personal platform, from which you can promote yourself, your products and services, or a cause you care about. There are no unrealistic promises of overnight success. No 'ten steps to doubling your email list' snake oil. The book makes it clear that you need to put in the hours over a long period to get results. He writes about having to explain to a depressed author that no, a good book doesn't stand on its own anymore, and yes, writers are now doomed to spend the bulk of their workdays trawling for blog subscribers. On the other hand, the advice does take into account that we have other stuff to do. Despite his thousands of followers, Michael Hyatt still writes his own blog posts and tweets. He has lots of ideas for keeping your self-promotion workload under control. The book is pitched at absolute beginners. If you have no idea what a hashtag is, or even what to use Twitter for, this will get you going. But I'm certain experienced bloggers will learn a lot too. I've picked up several things to put into practice on my site. I definitely need a policy page for comments and for reuse of my stuff. My 'about' page needs work to bring it up to Hyatt standards, and I'm also going to experiment with writing shorter posts, more often. The book is organised as lots of short chapters, each focused on one specific piece of advice. It makes for easy and repeated reference. Which is a good thing - there are too many ideas here to put into practice straight away. I also liked the way Platform is written. There's just enough theory to give context, but it's mostly practical instruction and personal anecdote: "my tweeting has not been without its challenges. I have probably made just about every mistake a user could make...if you are going to make mistakes, at least you can make different ones!" This is the book I wish I'd had to hand when I was coaching Executives through their first steps onto social media. Platform makes a strong case for why you should make the effort to do your own marketing, and then provides solid instruction and advice to get you started. Some of the links in the post above are “affiliate links.” This means if you click on the link and purchase the item, I will receive an affiliate commission. Regardless, I only recommend products or services I use personally and believe will add value to my readers.